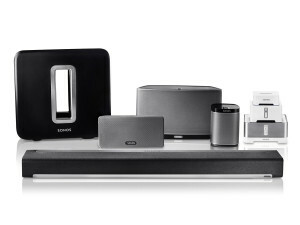 Sonos is the new gold standard in home music systems. With a lifetime of experience with audio systems and over 3 years integrating Sonos products, we are experts in demonstrating, installing, and supporting a Sonos music system for your home, office, or vacation home. Exciting news is the PLAYBAR which expands Sonos from a Music only system, to a TV audio system, to a complete Surround home theaters. We can help you select the right solution from a single room, to several areas, to integration with your existing video or whole house systems. Read a brief description of Sonos below and call or email us for more information and complimentary demonstration in your home or ours. 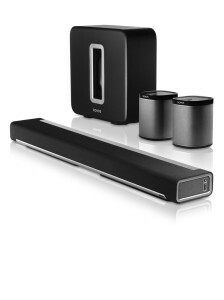 PLAYBAR: HiFi meeets HiDef. PLAYBAR’s nine-speaker design floods any room with super-realistic audio for games and movies, huge waves of live concert sound, and wireless streams of all the music on earth. And it all comes from one easy-to-use player that brings HiFi sound to your high-definition TV. Sonos is simple to control and expand. Control your listening experience using one powerful app to access your music with a modular system that can expand to other rooms in your home.